Feeling a touch slapped by the wonders of modern transit I awoke in a car passenger seat traveling through a bustling market, slightly disoriented and far from certain of location; leering unfamiliar faces, baobabs casting scant shade, humped cows, hairless sheep: Africa snapped to mind brushing aside fog of deep jet-lagged induced sleep. Ever heard of Bamako? 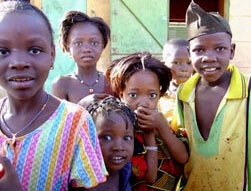 It lies beside the Niger River acting as principal city to Mali, West Africa. Honestly don't think I'd previously registered its name. Mali's initiation granted pleasant surprises, less was expected and the French imperial influence still resonated heavily. My school French hadn't been aired in a decade yet the slow nature of African spoken French surprisingly allowed understanding. I was part of a climbing/film team with fellow members having already been in the country for five days. Added at the last minute and required to absorb various vaccines before being granted a travel visa, hence traveling alone behind the others. Transit was quite surreal as I whisked through unfaltering terrain broken by a seldom river or cliff band. Unlike the Sahara this wasn't a sandy desert, big trees, lots of brush much more lush than the Stateside Sonora or Mojave deserts yet no common species. The river Niger acts as Mali's spine without its green belt the Sahara's desertification would creep faster from the north. 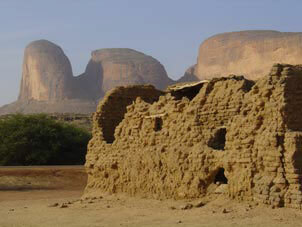 Beyond the principal city structures abruptly change, mud brick with the same mud as mortar assumes the standard. Appearance becomes melted by the rainy season. Residences are re-mortared yet walls and unoccupied buildings are left to deteriorate and display age in erosion. Weariness eased and conscious unclouded to the point where I began taking stock of surroundings: The journey ended we drew into basecamp beneath the Hand of Fatima. Ecology was that of a lush green land that had been sucked dry over night. All the brown shriveled husks of former life remained intact. Dry washes channeled flows to dehydrated millet, corn and yams. Spinney trees offered welcome shade from the powerful winter sun. As with most desert plants these deserved the utmost respect. Brushing local fauna tore flesh and left remnants deep under one's skin, I'm still discovering this. Two minutes off trail in flip-flops requires a week of coetaneous digging. Ironically one of the first 'Blacksmith' savvy tribes in the region produced a splinter kits and have for the last hundred years; two spikes and a pair of tweezers mounted on a ring, very handy. The Hand of Fatima occupies a monolithic stance. 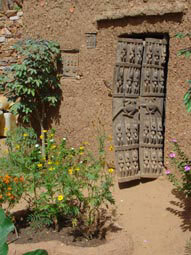 Its towers lie close to the town of Hombori within a region mainly occupied by Fulani tribe. Hombori's unique position shares tribal borders with the market drawing from many clans and their produce to trade: Dogon, Hogon, Senufo and the still feared Tuareg from the barren Sahara only 70km north. Feared because in recent history they attempted a regional coup and occupied Hombori and surrounding area, their insurgence finally suppressed by Mali's military but even they won't claim the ability to control the country's North / Sahara. 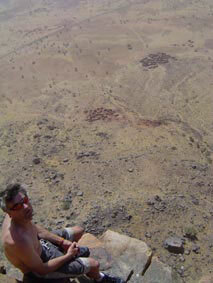 Cedar Wright, my climbing partner had already secured the Fulani Chief's permission to dwell and climb on their land. Kaga Tondo the largest 'finger' was our prime objective. 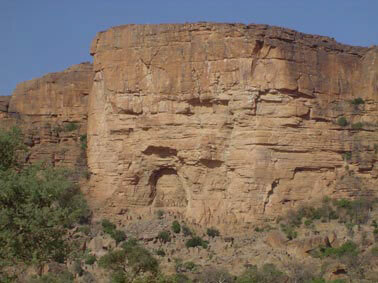 In native Bambara translating very simply as "Big Rock", the North Pillar of which was the route intended. Ideal for the film crew Kevin Kau & Andy Chapman who position themselves on the rounded summit of the Pregnant Lady (Debridu) to capture our ascent. Climbing went quickly and smoothly Kevin was pleased with his position and resulting footage. 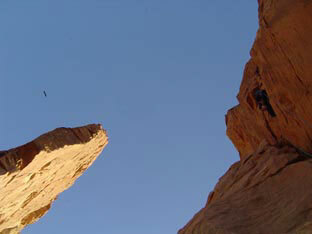 Jimmy Chin and Evan Howe filmed on the lower portion of the climb then traversed off to free the scene for Kevin's more distant perspective. Scale is harder to judge in primarily flat regions; the two thousand five hundred foot route didn't display its size from basecamp and en route offered only an abstract perspective, felt similar to climbing above the Kansas plain. Rock was of good quality, sometimes brittle and blocky but never dangerously loose, just a couple of sections requiring extra caution. Difficulty capped at 5.9+/10 yet remained sustained throughout. Bird and bat guano added heaps of character, literally in places all the cracks lined and sometimes heavily coated. Our style of ascent involved moving together at either end of the rope, "simul climbing": This technique eliminates the need to stop and create a belay anchor at the end of each rope length. 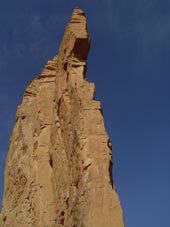 Climbing in 'blocks' allows several hundred feet of ascent before stopping to trade equipment and the lead, a technique that greatly reduces climbing time. Kaga Tondo's North Pillar is dubbed the world's longest sandstone route: Most importantly it proved a very, very fun outing. Nearing the summit as residents enjoyed their feeding hour, cracks spilled all sizes of birds into the sky: Swifts, Hawks, Eagles, Vultures and a pair of massive Storks. Named storks solely from looks but we never got a decent close-up view; they preferred surveying from high above while displaying proportions of a small Cessna. All creating a wonderful and unique summit experience. Treats after good climbing days were an 11km jaunt into the town of Hombori for Coca Cola and a very welcome break from our cook's faire. Hung out with the Major of Paris quite by chance. Incidentally, we drew the conclusion that Coca Cola has demonstrated itself 'the most global product', other Large brands aren't as represented on some continents Coke is truly everywhere. The longer plan for the Hand of Fatima was to enchain all formations in a single day. Beginning with the left/Southern formation Kaga Pamari ascended via the very recently established "Chin-Howe" route; fine work from the photo team resulting in a sporty 5.10+. Kaga Tondo's South Pillar followed, 5.10, A2 aid climbing being limited to a short bolt ladder straight out a ceiling. 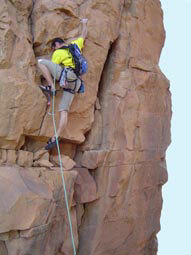 Mainly free climbing on stunning rock in great location and proved the climbing highlight. The two shorter middle towers we climbed solo up and down, 5.9+/5.10- on Wangel and only one technical pitch of 5.7 on Debridu. Suri Tondo the remaining formation could possibly the most aesthetic digit comprising the Hand. 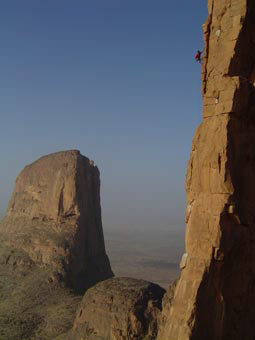 Scrambling lead to a mid way ledge from which Cedar began the first pitch just as the sun crept into diffusing dust above the horizon, resulting temperature drop proved a welcome change. Cedar admirably scrabbled through the lower guano coated 11d crux only to discover the route's true character. Fine crack climbing with bat induced cruxes; the hardest section during his 70m-stretched pitch was avoiding a short carcass filled crack. I began the next pitch as the sunset caused the crack's residents to awake and becoming increasingly agitated by my presence. Peering from within the fissure, many small eyes reflecting my headlamp as they scuttled unsettlingly towards the lip. Short overhanging sections forced tentative hands into jams within their reach but not before slapping the rock and yelling at the spooky gull sized critters. My pitch encompassed an 11c slippery layback followed by a memorable mantle onto a nasty hump of semi-petrified guano. The final seventy-metre pitch was thankfully free of crack life depositing us atop Suri Tondo eleven and a half hours after beginning on Kaga Pamari, the first traverse of the towers. During descent, we shared a small ledge while pulling the rope from a rappel anchor, Cedar's deafening screech almost caused permanent ear damage as a particularly large bat careened into his chest en route towards the night: Descent in the dark continued without further event. 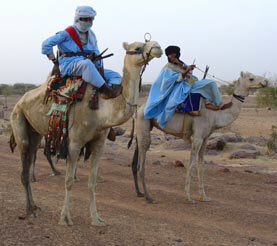 Exodus to the Niger River town of Mopti for Jimmy, Evan & Andrew the following day. 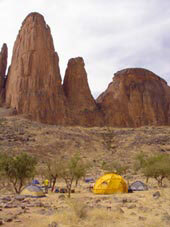 Cedar and myself felt ready to relocate and change character of the climbing but weren't ready to leave Mali just yet. 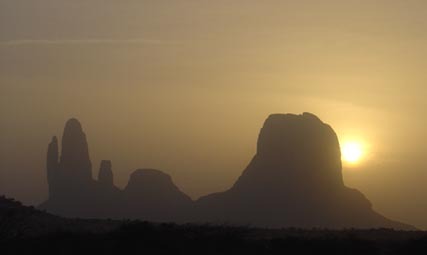 Falais du Bandiaghara became our new locale, famed haunt of the rock dwelling Dogon tribe and mythical Tellum: Occupiers of improbable villages built into caves part way up overhanging sandstone cliffs. 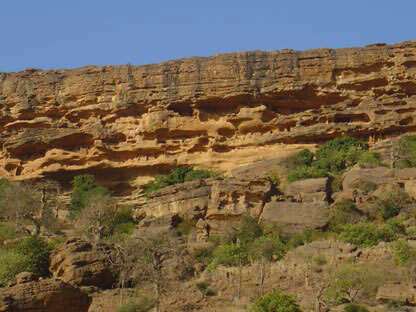 The Bandiaghara is both a several hundred mile cliff band and the region's principal city name. Cliffs have kindly shed thousands of smaller chunks perfect for a couple of climbers seeking something a little different. The rock was honestly as good as any I've ever touched, similar to the 'Iron Rock' of Hueco Tanks state park in Texas yet limitless. 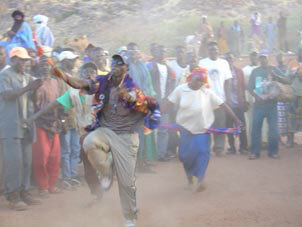 Civilization of the Bandiagara plateau began with the Tellum's flight from Islamic influence. Caves provided ideal seclusion & security to follow their Animist beliefs. After the Tellum, Dogons inhabited the region also managing to remain veiled from the outside world until "discovered" by French explorers a century ago. Tellum settlements are no longer occupied, the burial chambers are held sacred and still used for the high ranking. The Dogon prefer to build at the cliff's base and are famed throughout West Africa for farming skills; French farmers traveled to the Bandiagarha intent to give advise on onion production yet found themselves exporting newly gleaned agricultural skills. Three days was our time in the region, certainly somewhere to keep on the hit list. Think we left the locals a touch confused: Most foreigners trek a village or two then move on, we'd be observed sitting in the shade of a millet cabana until early afternoon; moments after shade arrived on the boulder field we were climbing for the day's remainder. 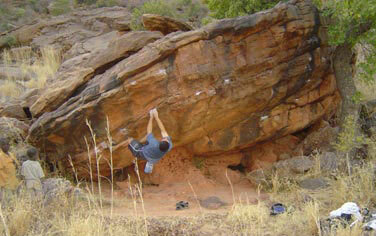 Usually followed around the circuit by what could become the Dogon's first technical climbing generation? Our white chalk dots scrutinized and often touched. Limitless potential, bouldering, sport and multi pitch routes: Wouldn't be surprised to read a great deal about the region in future climbing publications; really is some of the finest rock I've had the pleasure of pulling on and set in an unforgettable scene. View the Hand of Fatima with Google Earth Podcast download of North Face/New Line Cinema "Journey to the Hand of Fatima", right click the following text, then click 'Save Target As..' Clip of climbing Kaga Tondo.